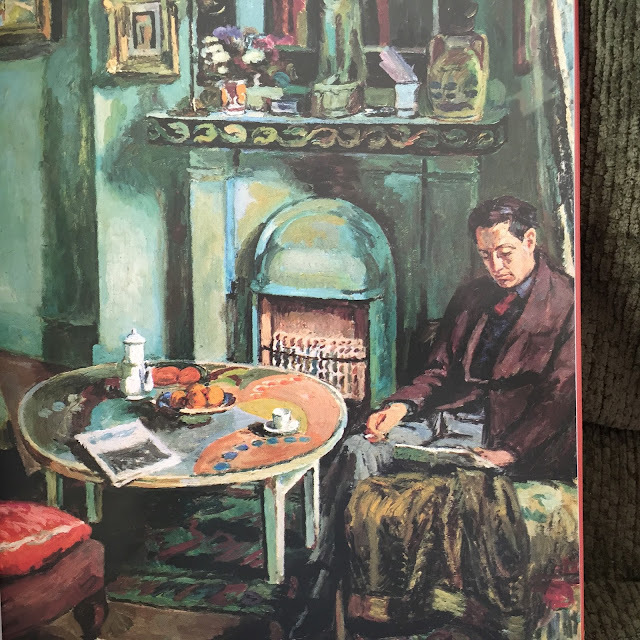 On Virginia Woolf's birthday, here are some words about her written by E.M. Forster. 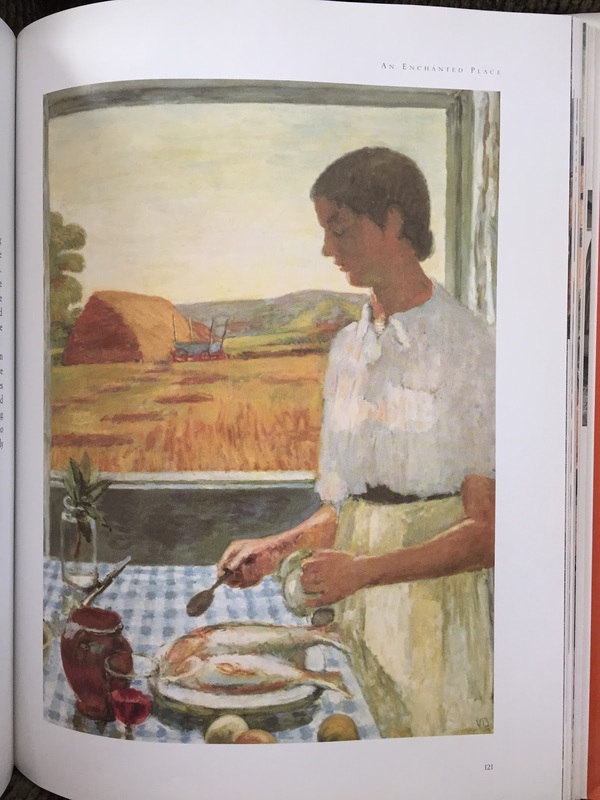 Real food is necessary, and this, in fiction as in her home, she knew how to provide. 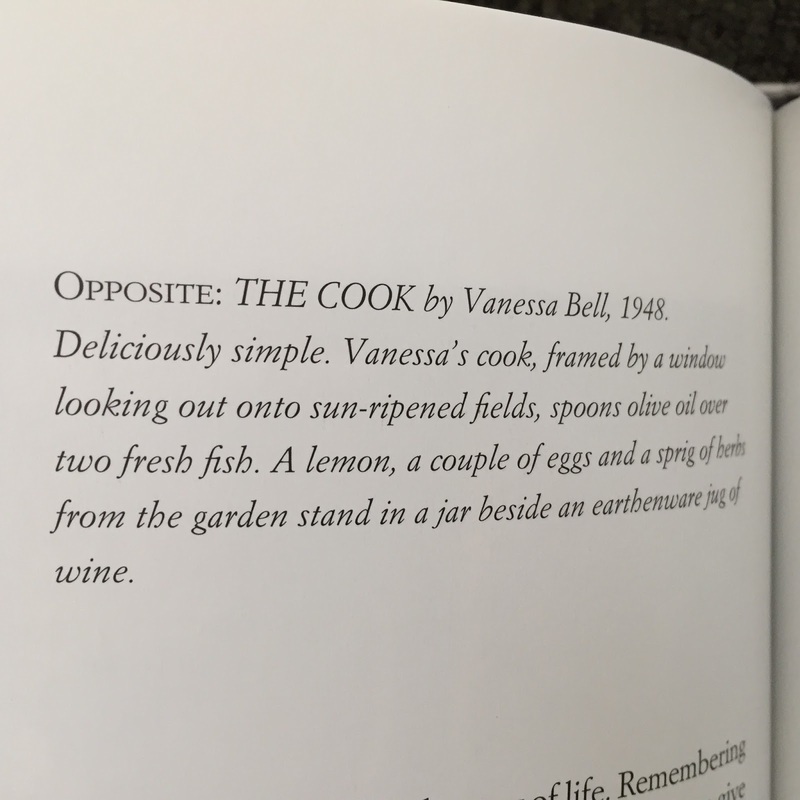 Food with her was not a literary device put in to make the book [To the Lighthouse] seem real. She put it in because she tasted it, because she saw pictures, because she smelt flowers, because she heard Bach, because her senses were both exquisite and catholic, and were always bringing her first-hand news of the outside world. 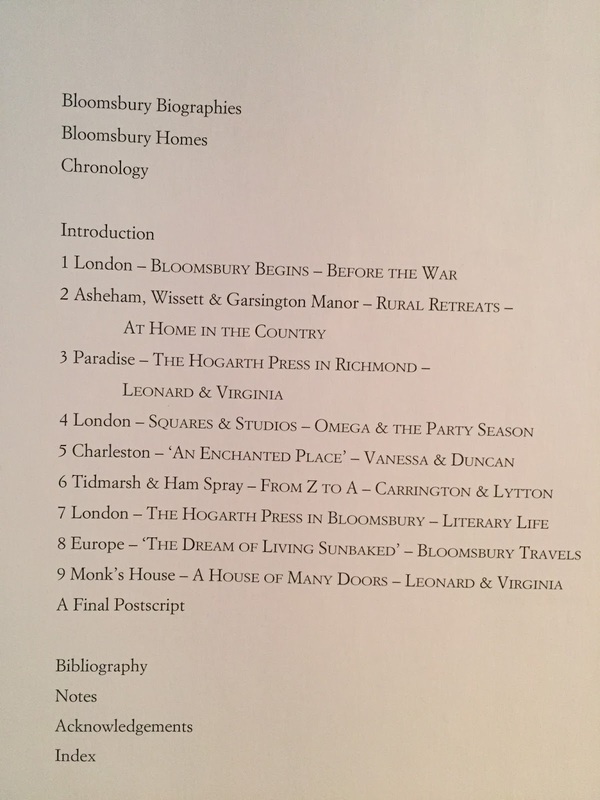 This book was given to me a few years ago by a woman who reads my letters and knows how I love Virginia Woolf and everything Bloomsbury. Such a kind and generous thing to do. I began reading it last year in January. For various reasons, I didn't get to finish so I put in a bookmark with a little note to myself to pick up the book again this year. 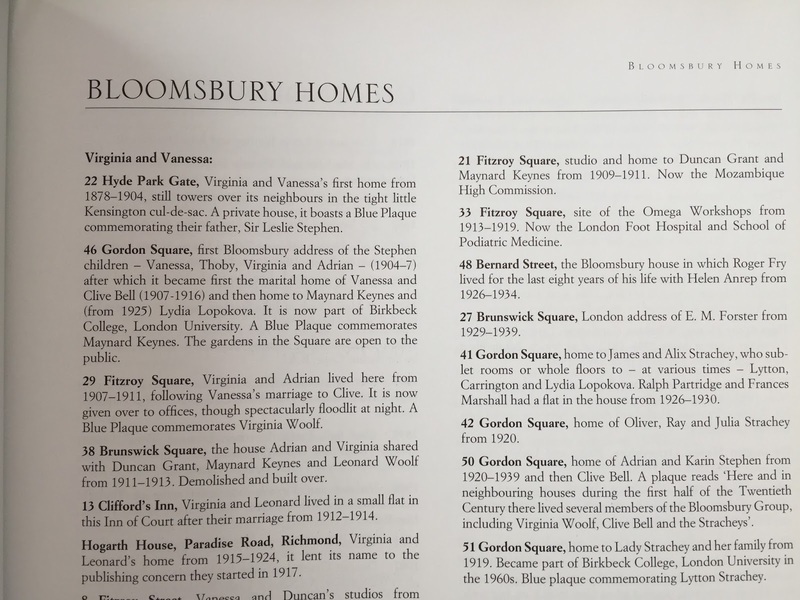 When their father died in 1904, Virginia and Vanessa Stephen and their brothers, Adrian and Thoby, moved to unfashionable Bloomsbury. There was little on offer besides a thrilling new kind of conversation which relied not on the usual party small talk but on ‘difficult’ silences which gave way to soaring intellectual discussions on large abstract ideas. The social conventions were ignored. These young men had no ‘manners’ in the Hyde Park Gate [the place they all grew up] sense. Instead of complimenting Virginia on her dress, they were more likely to praise (or criticise) the way in which she phrased her argument. This she found deeply satisfying. The scene reminds me of a Bob Dylan song, Bob Dylan's Dream. I think, if we’re lucky, there is a time in our lives when we do engage in conversation late into the night, forgetting there is a world outside. All is there within a room. I’ve never had the particular kind of relationships and conversations as happened when I was in my early twenties. Of all those people, only one is still a friend. Two of the young men died too young. The others have scattered and ‘grown up.’ But I remember those times with much affection, and even longing. It is a time and place which has never been repeated. These are so very helpful to the reader. 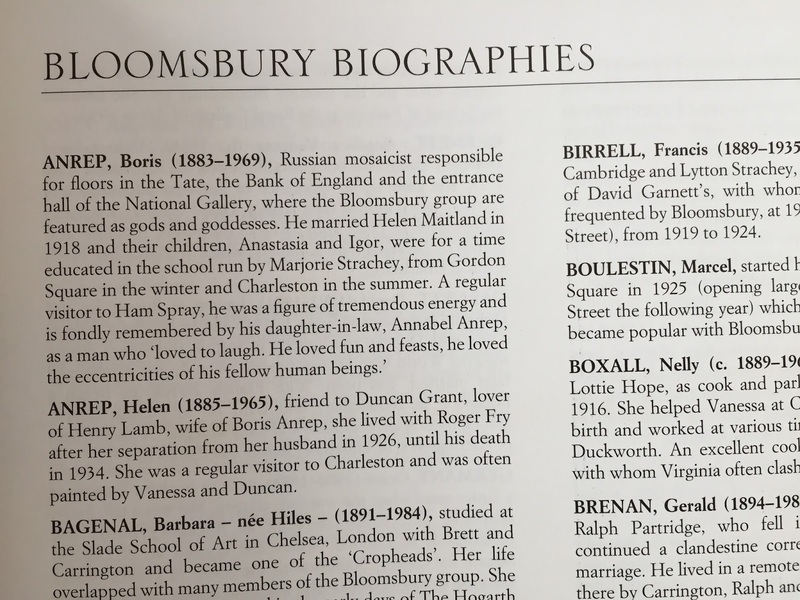 Whether you know a lot or a little about these people there is a great deal of information to keep straight and it is wonderful to be able to check back to see who was who, and who was with whom! 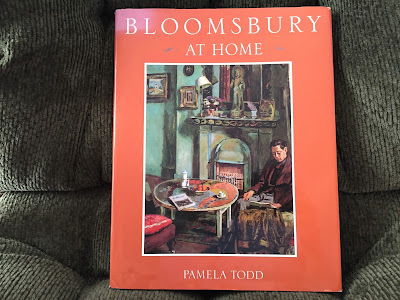 If you know a bit about the Bloomsbury people, you will know this story but it bears repeating even if you've heard it before. 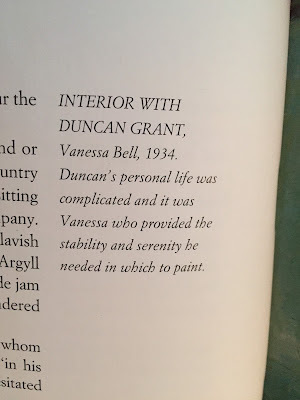 Okay, stay with me here... Vanessa was married to Clive Bell, but loved Duncan Grant all her life. 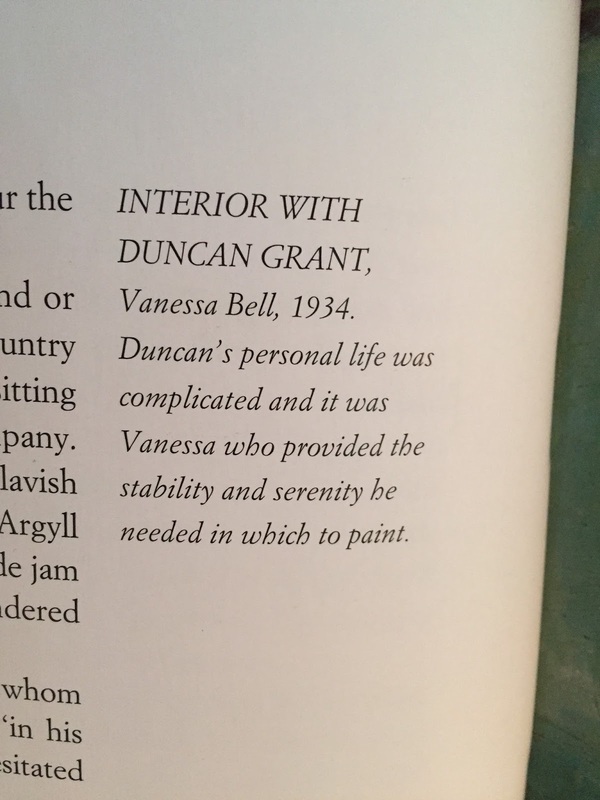 Duncan Grant was in a relationship with David 'Bunny' Garnett. Vanessa got pregnant by Duncan and had a daughter Angelica. Well, all that is pretty amazing in itself, but it gets better! In 1942, though Vanessa was opposed, Bunny and Angelica did indeed marry. She was 24 and he was 50. They had four daughters. I've yet to read Angelica's book Deceived With Kindness: A Bloomsbury Childhood, but I've ordered a copy. The deceit here is that she was told she was Clive's daughter for a long time. 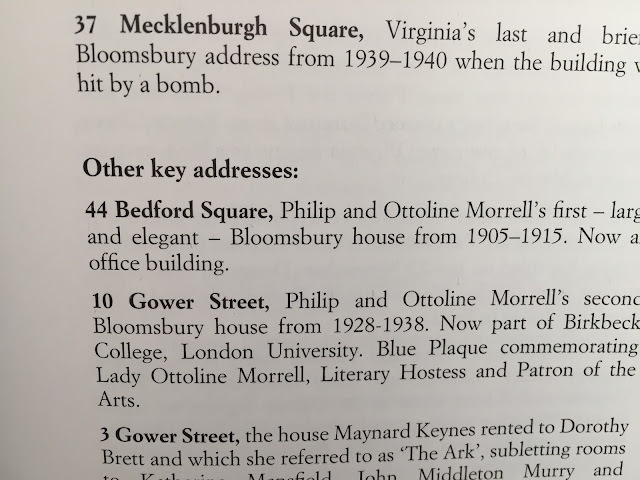 Bloomsbury at Home is full of terrific details about the various places everyone lived. 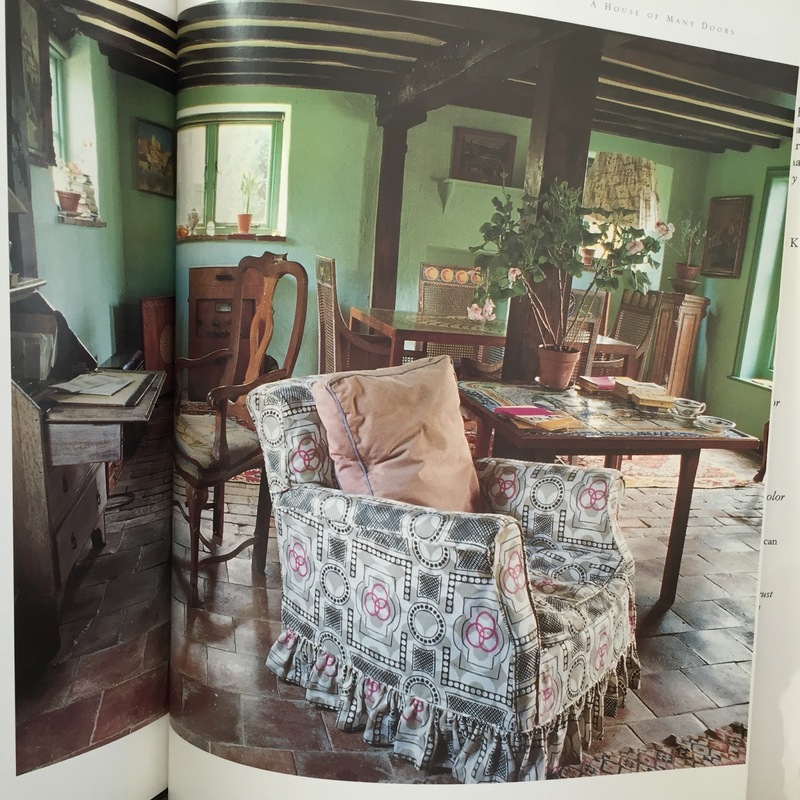 Almost every page has a painting or photograph. In a little over 180 pages, you can learn so much about these individuals. It is a great place to begin if you are not familiar with them, and an excellent resource if you already know a fair bit. Now that I've read it in its entirety, I expect I will be dipping into it for the rest of my reading life. 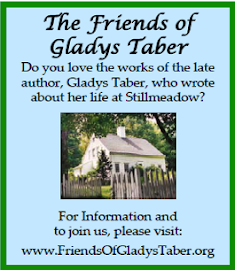 It is scholarly and fun at the same time. It is a joyous exploration of some of the most interesting and artistic people the world has ever known. I loved, loved, loved this book! Traditionally, it falls to the first grandchild to name the grandparents. 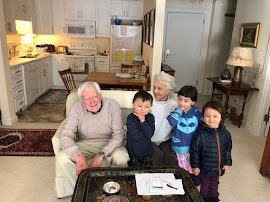 Tom, the first grandchild of his mother's parents, named his grandparents Gamy and Gampa. Our Margaret is the first grandchild of Tom's mother, who wanted to be called Nana. When little Margaret said it, it came out ‘Nina.' The whole family calls her Nina now, and that's where Hazel's middle name comes from. 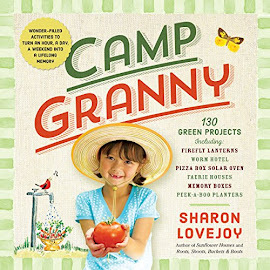 Since our grandchildren have been born, we've called ourselves Grammy and Grampy. 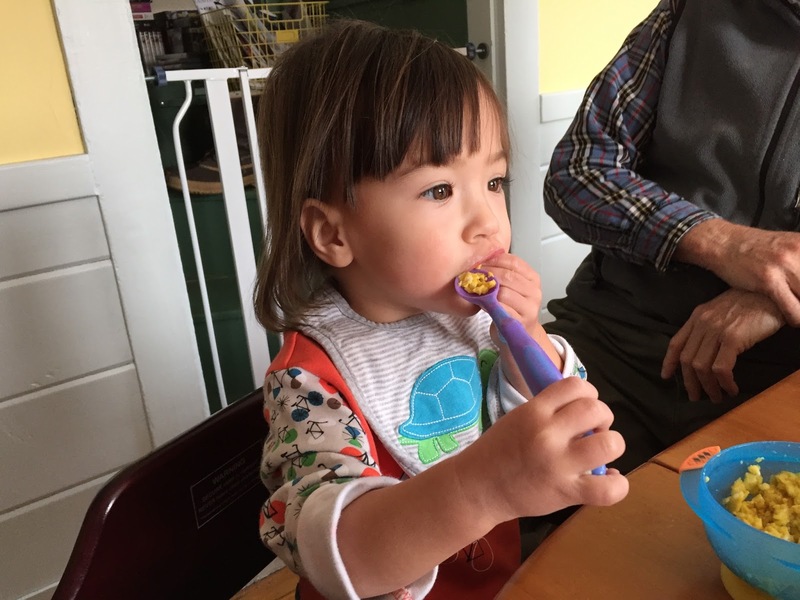 Now that Hazel Nina has begun talking, she loves naming everyone (and everything) but she couldn’t say those words. Tom and I tried to come up with easier alternatives. 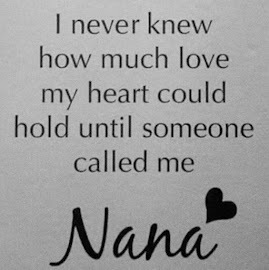 Nana seemed the obvious choice for me! Tom's mother called his grandfather ‘Pop' and he liked the name. Hazel repeated Pop and Nana perfectly the first time she heard them. So we are now and forever Pop and Nana! We love our new names. If you haven't heard of Call the Midwife, you may go to Netflix Instant and see the first four seasons. I'm not sure there has ever been a more wonderful television program. Because I have Tunnelbear I just saw the first episode of season 5. It deals with a baby born with truncated limbs. I expect you have heard of thalidomide, and season 5 is going to address the subject. I cannot praise this show highly enough. 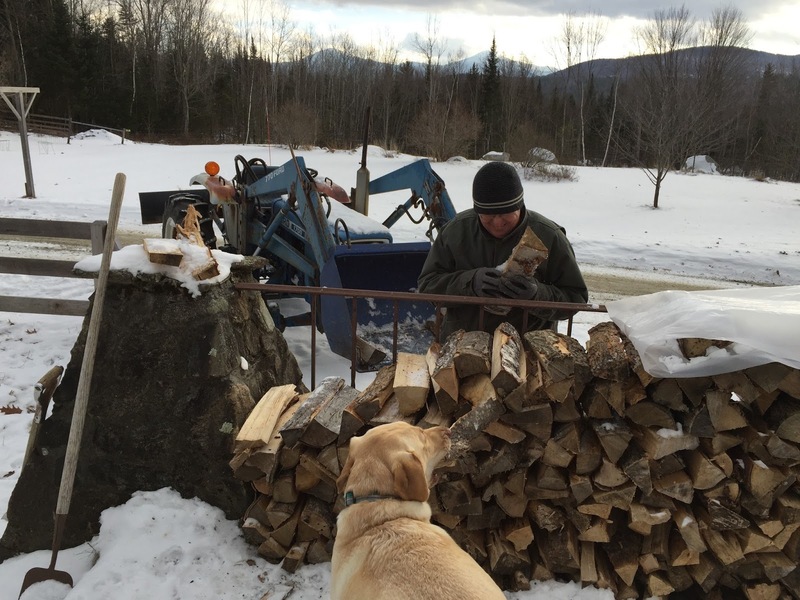 Lucy the Labrador is wild about wood! Tom piles it and she very carefully chooses pieces to pull off. She might pull one off the top, or pull one out that is five layers down. Sometimes there are up to ten pieces around the yard. It is just the funniest thing, as you can see from Tom's laughter. How we love this dog! I can’t praise this book enough. 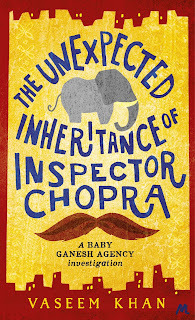 I loved every minute of my time with Inspector Chopra (Retd). He is still a relatively young man who must retire from the police force in Mumbai because of a recent heart attack. We meet him on his last day of work. He comes upon a case of a young man found dead. It is deemed an accidental death and the police do not intend to spend any time on it. But Inspector Ashwin Chopra hears the boy’s mother say that her son’s death is being neglected because he is only a poor boy. 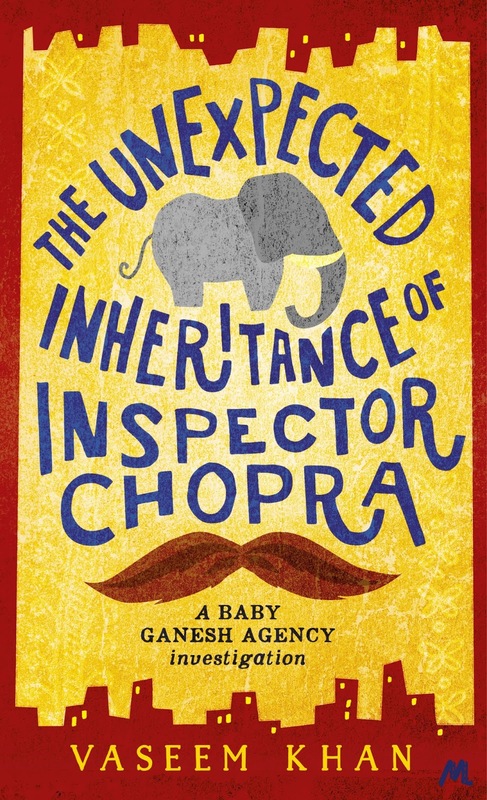 Because Chopra is a good man, an honest man, and a caring man he takes her words to heart and begins his own investigation though he is not an official police inspector anymore. It is my request that you take in and care for this elephant. It is a newborn, not yet a year old. If I were to tell you the circumstances by which this elephant entered the world you would not believe me, at least not yet. Let me say only this to you: this is no ordinary elephant. Remember what is real and what is illusion is only a matter of perspective. Can you imagine such a thing?! Mumbai is not a verdant, rural retreat. This is a city teeming with people everywhere. Chopra’s home is an apartment on the 15th floor. For the time being, the elephant named Ganesh is hitched outdoors near the hut of the security person. Chopra has a wife called Poppy. Her mother also lives with them. There are no children which is a great sadness to Poppy. Vaseem Khan brings the city of Mumbai to life. The reader can feel the heat and the rain and the smells; the poverty and the richness and the corruption and the wonder of this place. Although I’m unlikely to ever go there, India holds a place in my heart like no other. This is just a wonderful book, and I and have pre-ordered the next one which is due out in the US this summer. 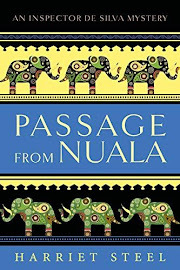 The characters are so appealing, the elephant is a delight, the mystery a good one. Really a perfect book for me. Highly recommended. When I read Persephone Books' description of Greengates here, I bought it immediately. 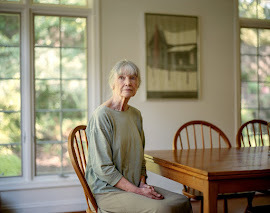 I thought that this would be an interesting take on a time of life that I am in just now - retirement of a husband, and how it affects the wife. Tom Baldwin is retiring at 59 years old, and comes up with first one scheme and then another to make this a terrific new page in his life’s book, but each of them fails and he falls into despair. In the meantime, his wife Edith misses her daily routines. When Tom decides to spend an hour every day reading in the drawing room it disrupts Edith’s much-loved nap. They find they have nothing to say to each another. When he worked they would talk about their separate days. Now there are no stories to relate. Edith does try to encourage and support him, but the situation feels hopeless. They have disagreements. Tom gets angry with their old maid. We get glimpses of their fond feelings for one another, but the times are fleeting. As I write this, it sounds bleak. And it is. Until a beautiful fall day. Saturday, the 28th October: a date that Tom and Edith Baldwin were to remember with feelings close to reverence: a date of deliverance. Edith suggests they take a walk they haven’t done since before the war. They both remember it fondly, and so they do it. When they come to the little village, they see a new road and houses being built. At first they are chagrined. They fear the beautiful countryside will be ruined. Then they are coaxed into visiting one of the houses by an eager agent who is new to the job. They both fall in love with it. 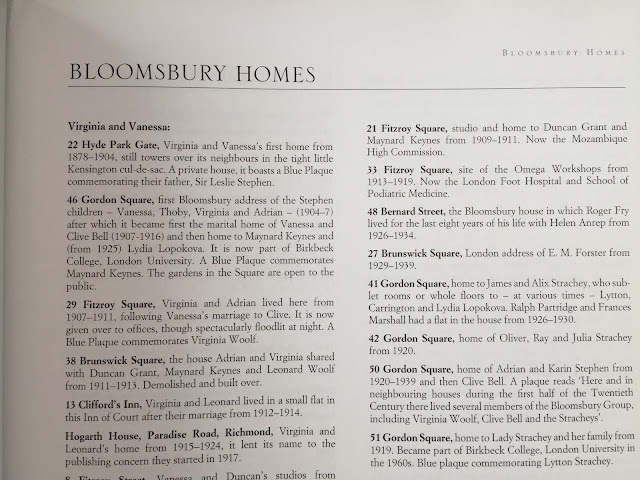 It is clean and bright and cheerful and welcoming; everything their house in London is not. They begin to look at their home with new eyes. They see how dingy and uncomfortable and old-fashioned it is. Tom connects it with themselves. They are older and need a fresh start. The book proceeds to show all the work involved in making this happen. They don’t want any of their old furniture in a beautiful new house. They must sell it, and the house, and there is concern there won’t be enough money. But it all works out, and the house of their dreams is built on a few acres, and in sight of the footpath they walked upon to reach it. 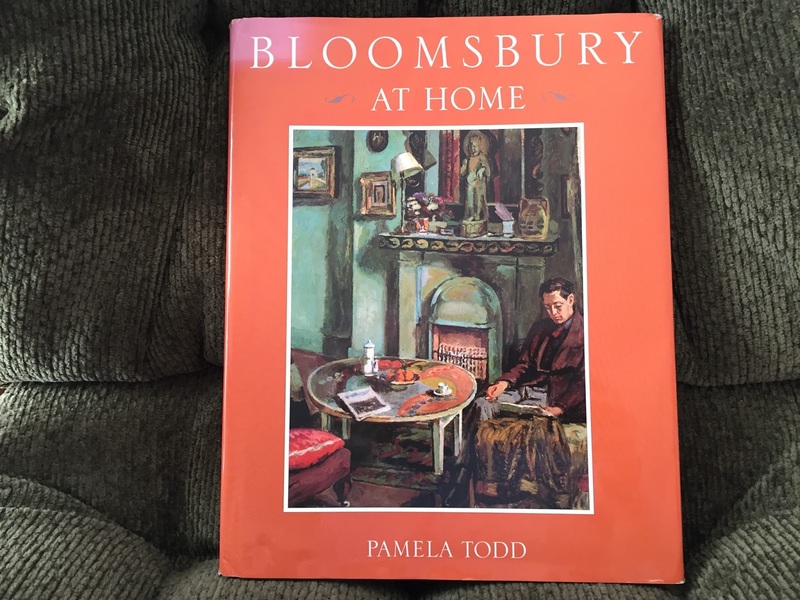 The author does a wonderful job of getting inside Tom and Edith’s heads to show us the excitement, worries, enthusiasm, and fears that accompany their big decision. On their first evening in Weldon Close, Tom meets a man in the neighborhood who wants the homeowners to build a clubhouse that will offer activities for the residents. The man is a most disagreeable sort (and racist, the reader recognizes), though Tom doesn’t see this at first because their evening is spent in the warm glow from whisky, and all things seem possible. Again, Sherriff shows us all the emotions that are stirring around in Tom’s head. He concurs with Mr. van Doon about some ideas but has his own notions that he wants to put forward. At nearly the end of this fine, wise book a couple in what is now known as the ‘third age’ begins a most agreeable, pleasant, and worthwhile life. 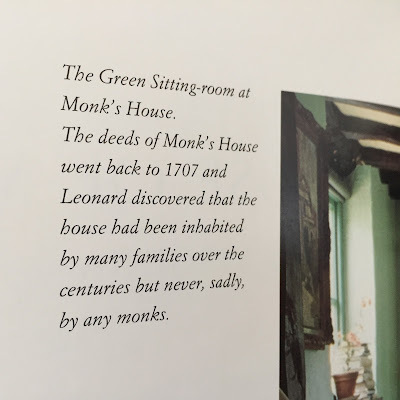 The last part is told by a visitor who used to work with Tom, and I found it a lovely way to tell the readers what had happened in the ten years since Tom and Edith arrived. Greengates offers hope to the reader. It shows that older age does not have to be lonely and without purpose. It may seem as if I’ve told you the whole story, but really this is just the bones of the tale. RC Sherriff is a master of showing the lives of ordinary people. His characters are as real as if they lived next door. I enjoyed reading it, but I didn't love it as I did Sherriff's The Fortnight in September (which I wrote about here). Though I identify with the couple's stage of life, they are very different from Tom and me. Retirement for him has been getting to the things around the farm that he didn't have time for when he was working. And we have children and grandchildren so we luckily and happily don't lack for companionship. We would never be part of a club, and would rather read than participate in a round of social activities. 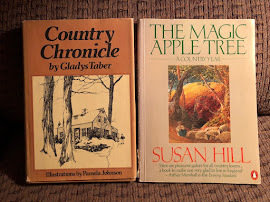 Before Persephone, I had never heard of this author, and I am so grateful they have brought his books to modern readers. 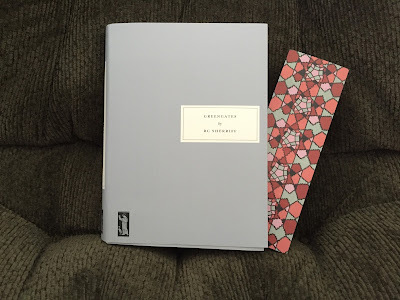 Starting in December and going back to January 2015, here are my top favorites of last year. Although I love the Arthur Upfield ‘Bony’ series, I couldn’t come up with just one. Two rereads in the group. 6 nonfiction, 7 fiction, 1 mystery. Every one was published in the 2000s. 6 by women, 7 by men. 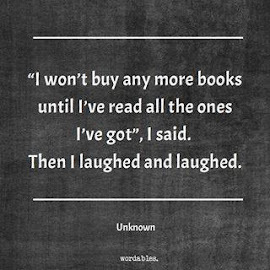 8 print, 5 kindle. 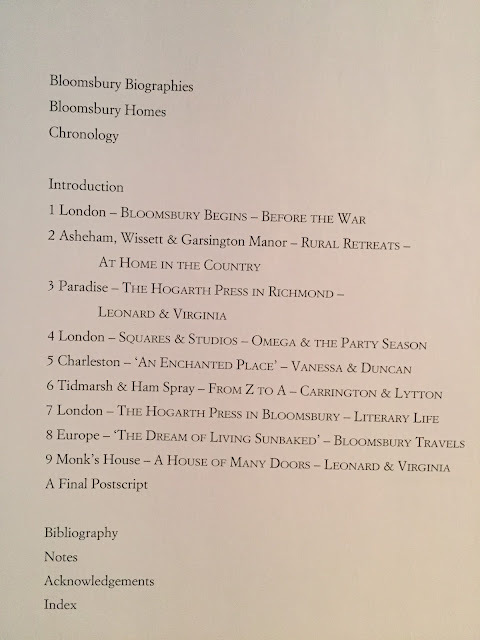 1 library book. 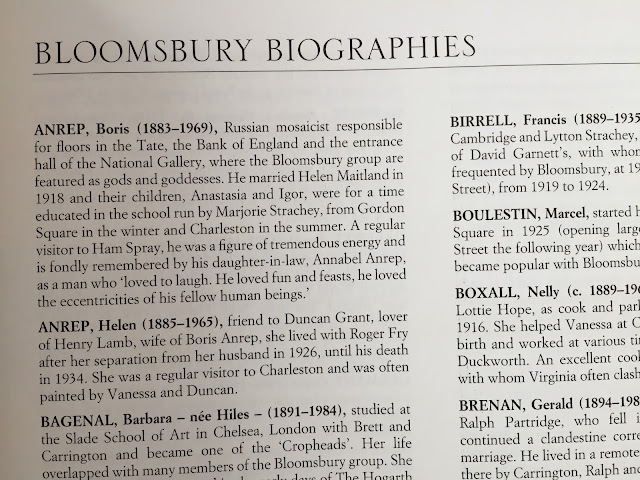 At the outset, biographer Sonia Purnell didn't know much about Clementine Churchill. "I confess, like millions of others, I had absolutely no idea who Winston Churchill's wife was," Purnell tells NPR's Steve Inskeep. She once said early in life she would have loved to have been a statesman in her own right if only she had been born with trousers rather than petticoats. But then Purnell stumbled onto a letter from 1940, when Winston Churchill had just become prime minister. It was the middle of World War II, and England was in a very bad state. "She realized that he was in danger of losing support of the very people he needed most," Purnell says. "He was being brusque and rude and rather overbearing. So, she wrote him this letter. And it just tells him how he needs to bring people alongside him, to make them love him. His behavior changed as a result of this. And people changed their minds about him." After reading that letter, Purnell had to find out more about the woman who influenced England — and her statesman husband — through two world wars. The result is Clementine: The Life of Mrs. Winston Churchill. Purnell talks with Inskeep about Clementine Churchill's background, her ambition, and what she'd be doing if she were alive today. I think she realized she couldn't be the ordinary wife. She would lose Winston. She would never see him. So really from very, very early on, she threw herself into making herself the right sort of woman for him. She wanted to prove that she was up to it. A lot of people thought she wasn't when she first married him. She'd come from this rackety background. She was quite shy. And so she pushed herself to become this incredibly wise, measured, knowledgeable, well-read person. She was the granddaughter of a Scottish earl. 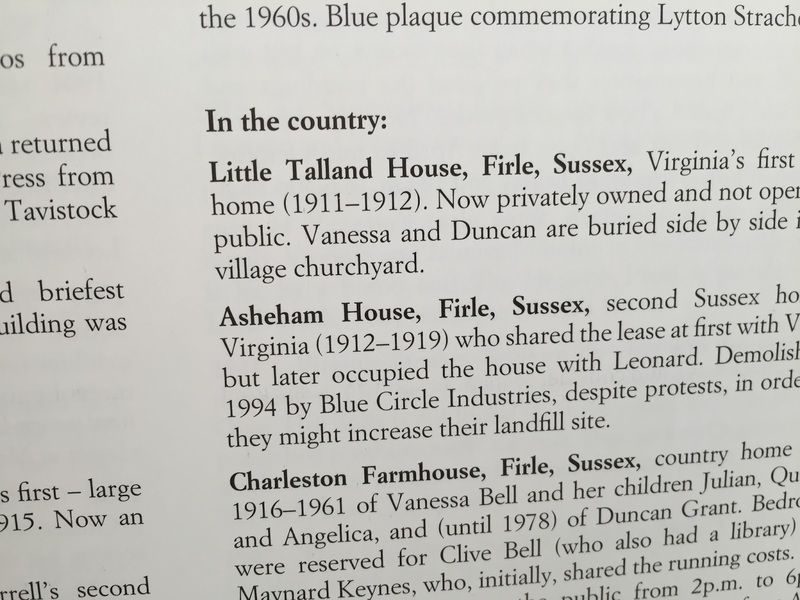 But her mother was something of a Victorian wild child: Lady Blanche. She was married off, and it was a pretty loveless match. He didn't want children. She did. She went about this with some enthusiasm, shall we say ... without him! ... She had up to 10 lovers on the go at once. As a result of this, her mother was shunned by polite society, had very little money. They kept having to move house. Her putative father, [Sir Henry] Hozier, tried to kidnap her. She managed to escape. But none of this was the sort of life you would normally expect of the granddaughter of a Scottish earl. I think because of her rackety background — she had no money, she was making her own living — she wasn't like the normal society women that he'd met, who were interested in frocks and balls and not much else. So, suddenly here was a woman who was interested in what he had to say about all sorts of things, and he found that thrilling. She found it rapturous that here was someone prepared to talk about great and exciting world events — events which she wished she could be a part of. The Churchills — Winston, Clementine and two of the their children, Sarah and Randolph — head to the House of Commons on Budget Day, April 15, 1929. His career was completely shot. And she saw that the way back — he had to redeem himself. And if by volunteering to fight in the trenches at the Western Front, he could show people that he wasn't this hothead. He wasn't just all about him. Yes, can you imagine? ... A wicked bullet could find him at any moment. But she wanted people to want him to come back. She knew that if he just came back, people would say, "Oh, it's the same old Winston. He's not learned." If he stayed out there long enough that people realize that he was needed, then that would be different. She saw that all Britain had in 1940-1941 was a collective spirit, and that had to be fostered and nurtured and protected. And yet, people were discontented. The air raid shortages and the Blitz — they were pretty horrible. They were cold; they were dark; they were scary. And so she went about ordering all the government ministers around:Please put heating in there. Please make sure there's a fire exit there. Please manufacture 2 million new beds so people can sleep alongside their children during the raids to stop them from becoming too frightened. She saw that by dealing with these problems, you would foster that incredible Blitz spirit that people still talk about now. Eleanor Roosevelt (left) and Clementine Churchill pose for photographers shortly before making an address over the CBC network in 1944. Sometimes I look at some of the political spouses today and I wonder where their ambition is. I mean, obviously times are different now. But in Britain, you very rarely hear anything about the prime minister's wife apart from what frock she's wearing or where she went on holiday. I'm amazed, really, that we're still in that position where we don't celebrate the fact that in many ways we get two for the price of one, because with the Churchills, we did. She once said early in life she would have loved to have been a statesman in her own right if only she had been born with trousers rather than petticoats. I think if she were alive today, I suspect very much that she would be in the British Cabinet. She would certainly be an MP, and maybe, who knows, she might've gone for the prime minister's job herself.